You and your friends are strolling along the sidewalk in a Costa Rican beach town when someone approaches you, suggesting a horseback tour at a price way below those offered in the tour guides. It sounds like fun, and it sure is a good deal. But is it a good deal for the horses? 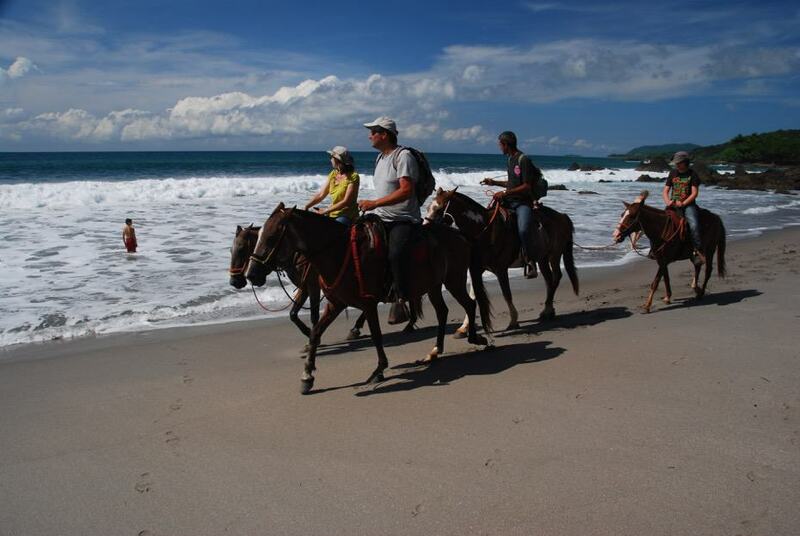 Horseback riding is a popular activity for visitors to Costa Rica, and there is a wide of variety of horse tours in a range of prices and locations – from easygoing rides for those not use to the saddle, to longer ones for the experienced. However, tourists can help by attempting to ensure that the companies or guides they choose to use care for their horses well. This is a new goal for members of McKee Jacó, the organization known for low-cost spay-neuter programs on the Pacific coast. With posters and flyers showing an overworkedcartoon horse, they hope to raise awareness among tourists and Ticos alike. “There are operators of house tours that approach tourists on the beaches or along roads offering horse riding at low, low prices. Tourists, thinking of saving money, accept,” says McKee’s Katya Bader. “But the horses may be in bad condition, overworked or dehydrated, or they may have sores. These tours do not offer insurance in case of accidents, and are probably illegal,” she adds. The National Animal Health Service (SENASA), Costa Rica’s animal health agency, is concerned about horse treatment here, including hoses used for tours and riding academies. The agency issues a certificate called a Certificado Veterinario de Operación, or CVO, to tour operators who comply with the agency’s requirements and national laws governing animal welfare. Visitors can ask to see operators’ CVO certificate to verify that the operation is on the up and up and that the horses meet health standards. Horses rank in popularity right behind dogs and cats here, for riding, petting, work, and for topes, the horse parades which can draw thousands of horses and riders. Horse events are also included at community festivals and parades, and the police department has 70 horses for their mounted police units. SENASA’s veterinarians are kept busy trying to make sure horses are kept in good condition. Other measures tourists and horse enthusiasts can take, according to Baker, are booking horse tours through hotels or reputable tour agencies, and doing some homework on any tours offering low prices. Some hotels are helping the Jacó-based project by posting signs in their parking lots or putting up stickers in their reception areas. Further plans are for a brochure for tourists on what to look for in a healthy horse tour. For more information on McKee Jacó or this campaign, visit the organization’s Facebook page.